Articles related to Apple or Apple products. 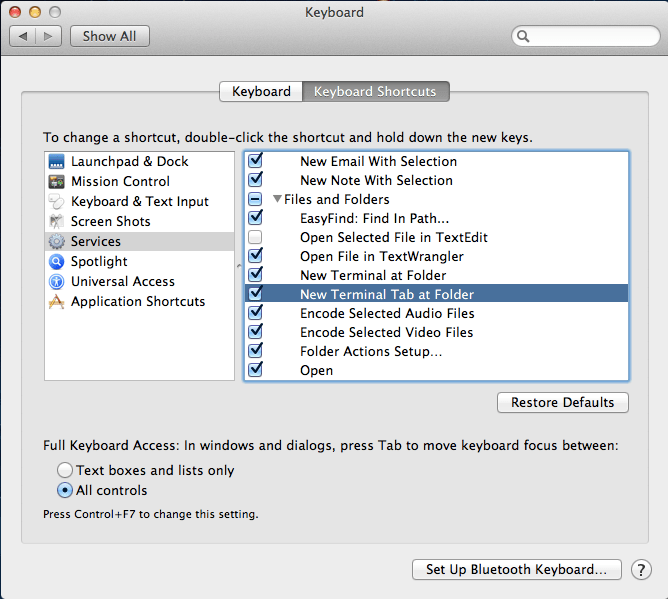 Go to System Preferences→Keyboard→Keyboard Shortcuts→Services and enable “New Terminal at Folder” (or “New Terminal tab at Folder”). It is also possible to add a keyboard shortcut for the command, e.g. Shift-Command-T. Adding a shortcut will disable the service from the context menu list so you might want to enable it again by checking the box. To bring up the context menu and the possibility of selecting “New Terminal…” one must select a folder.